Individual art ceramics and everyday pottery. A large amount of gift articles is always available. I will be happy to implement your personal ideas into clay. Action Painting for Company and Team Events. Action painting means experimentally spraying or dropping various colours onto exclusive 3D canvas by the use of body movements. Steinauer Art Garden and Gallery. Have a closer look at the artist family's iron works and check out their sculptures and animals full of wit and charm. In the Töss Valley, hand-weaving used to be part of everyday life. 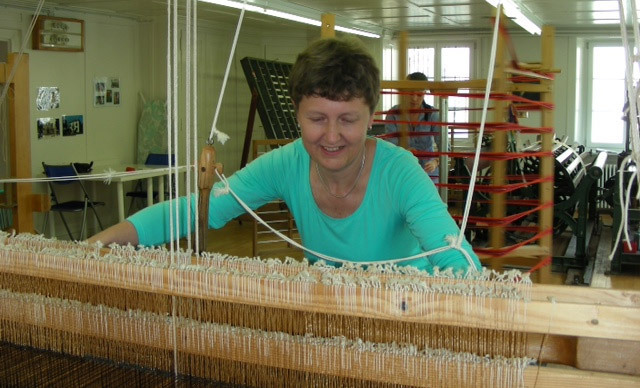 Today, the hand-weaving company in Bauma is one of the last active and professional operations of its kind in Switzerland. From the sheep to the duvet. We process Swiss sheep's wool to the finished product. You will find sheep specialities as well plant-dyed wool at our farm shop. Be it as a family, a company or group excursion, you have come to the right place! We have over 200 different green ceramic articles available for you to be painted. In Mettlen-Güntisberg, an entertaining exhibition has been arranged with over 50 objects made by the sculptor Yvan «Lozzi» Pestalozzi.